I made these lemon coconut bliss balls for my essential oils class last night, my final one before I scoot off to Bali - woooooooo! 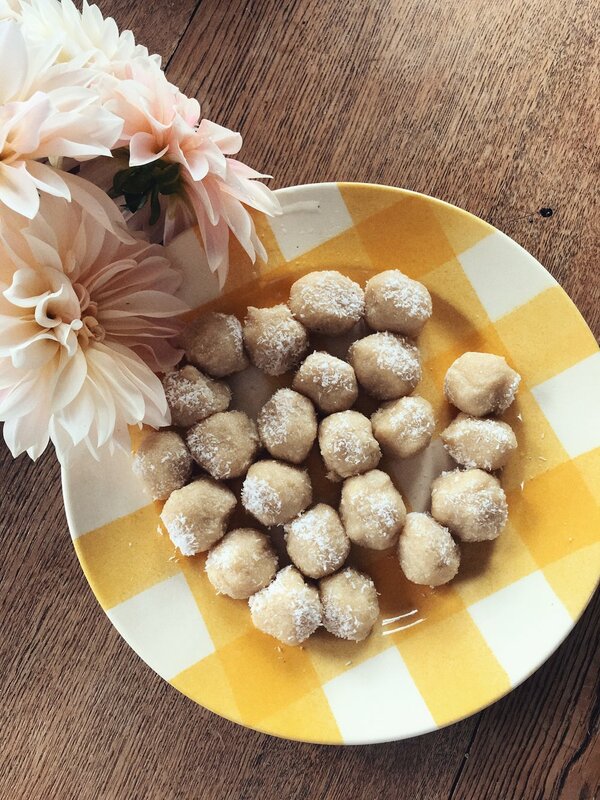 Bliss balls are a great little snack to make at the start of the week and pop in your bag so you're not tempted to snack on biscuits and sweets. They are gluten, dairy and refined sugar free, but full of good fats and carbs to keep you sated - if you have them as an afternoon treat - right through til dinner. Chuck everything in a blender and go to town. (I didn't have a blender so smooshed them all up with my hands.) Then roll into small balls in your hands and roll in coconut. Pop in the fridge for 30 minutes to harden. These also freeze really well, so a great one to have on hand when unexpected guests pop over. Add to still or sparkling water to jazz it up a bit. When taken internally, Lemon oil can also naturally cleanse the body and aid in digestion as it goes straight to work on the liver. It is also known as a respiratory agent for those prone to seasonal allergies. Add a few drops of Lemon oil to water and rolled oats to naturally exfoliate the skin without harsh chemical cleansers. Add 2 drops of Lemon in a spray bottle with 2 drops of Oregano and On Guard oils for a powerful scratchy throat spray. Alternatively you can add two drops of each to a vege cap and swallow to nix any cold and flu bugs. Preserve leather furniture by wiping it down with a Lemon oil soaked cloth. Have any other uses for Lemon oil? Let me know in the comments below. Ps. If you'd like to learn more about essential oils, or purchase the highest quality Lemon oil from a company with an outstanding ethical and moral compass, you can do so here. At NZD$16 for approximately 250 drops per 15ml bottle, it's completely affordable.